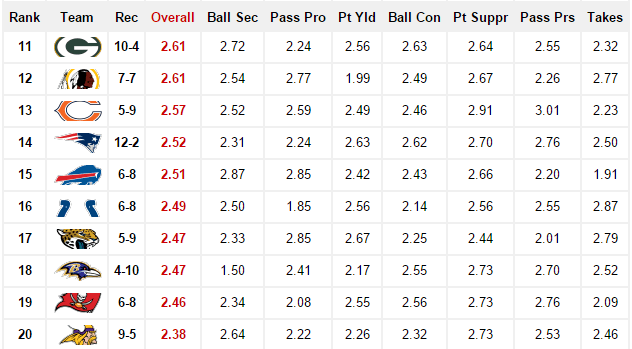 With two weeks to go in the regular season, our rankings continue to reveal which teams are heating up at the perfect time and which squads are losing steam as the postseason approaches. The Panthers (14-0) claim the No. 1 spot this week as they continue to surge toward January. Though their BES Overall score increased by just .01 points, the fact is they keep improving despite their unblemished record. 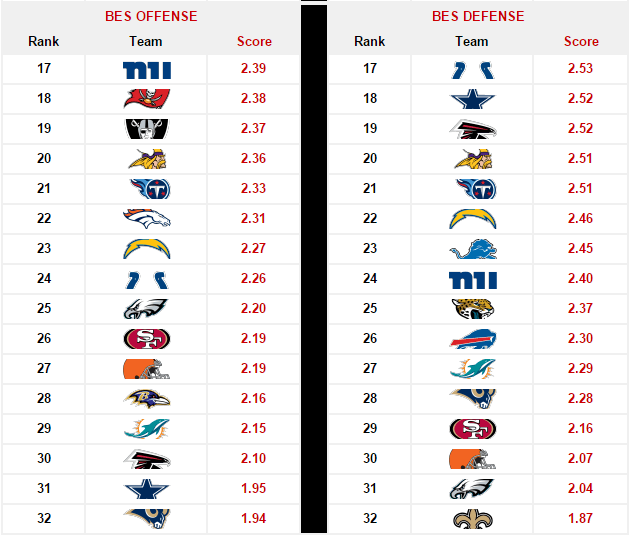 For a second consecutive week they hold the top spots in both BES Offense and BES Defense and are the only team to have done so this season. Despite a narrow 38-35 escape from the Giants (6-8), the Panthers remain the most formidable team in the NFL according to the BES. 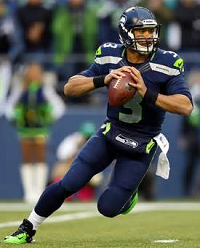 Seahawks quarterback Russell Wilson has thrown 20 touchdowns and just one interception in his last six games. One team that arguably poses a significant threat to the Panthers is the Seahawks (9-5) who have risen from No. 4 in our Week 14 rankings to settle in at No. 3 this week. The Seahawks might be known best for their defensive dominance over the last several seasons but it is their offense that has fueled their push toward the playoffs this year. 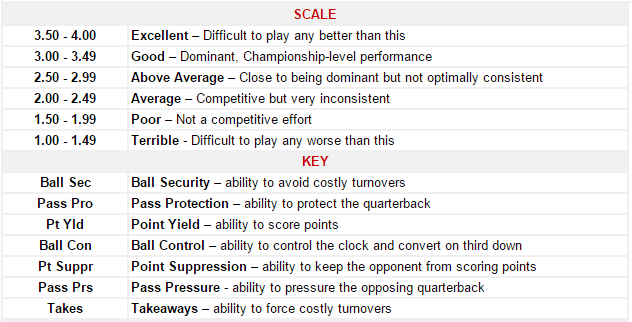 This is evident in the Seahawks’ No. 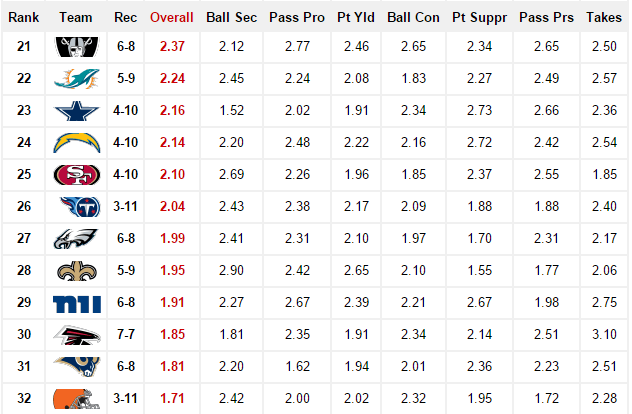 2 ranking in BES Offense this week with an impressive score of 3.16. The Chiefs (9-5) come in at No. 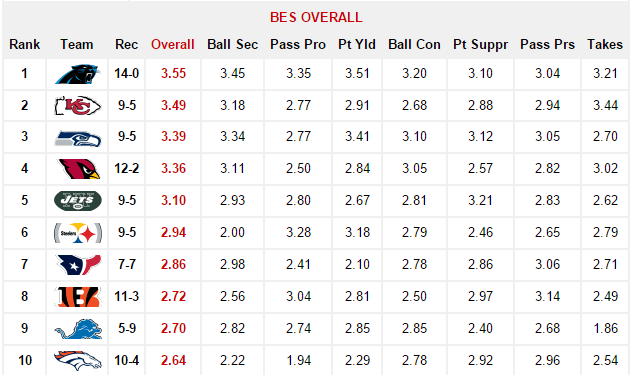 2 in BES Overall this week after holding the No. 1 spot in Weeks 12-14. 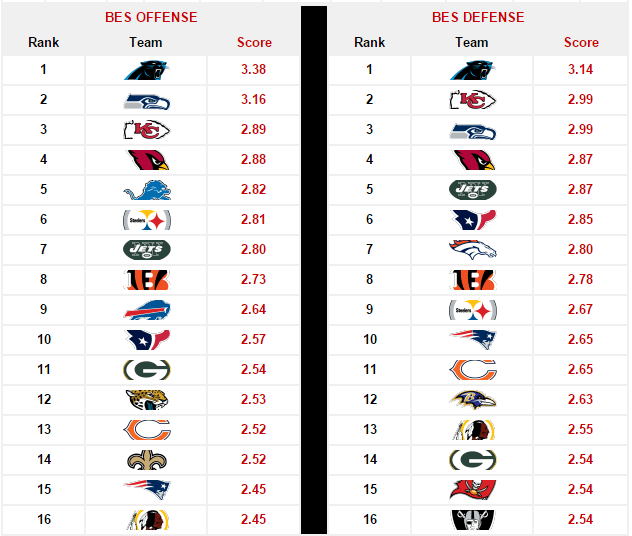 They continue to be anchored by a defensive unit that has ranked among the top-three in BES Defense since initially joining the group in our Week 10 rankings. Though the Chiefs high-ranking in BES Overall the last few weeks was met with some criticism, they presently own the third best conference record (8-2) in the AFC and the best division record (4-1) in the AFC West. Another AFC team surging down the stretch is the Steelers (9-5) who have landed at No. 6. Like the Seahawks, the Steelers are also 5-1 in their last six contests which includes a 33-20 road victory in Week 14 over the recently crowned AFC North Champion Bengals (11-3). If the Steelers, who rank among the top-10 in both BES Offense and BES Defense, clinch a wildcard berth, their growing momentum and balance could prove problematic for any potential playoff opponents.